Spring is approaching in the Southern Hemisphere, but I’m pretending it’s fall. With one day left in New Zealand, followed by a couple weeks in Australia and a few days in Fiji, I’m learning to embrace the spring. But I’m pretty excited to go pumpkin crazy this November! Iceland’s summer is uniquely beautiful. I’ve seen wildflowers before, but nothing quite like this. With conditions perfect for the growth and spread of the lupine flower, they’re a more common site than those furry little horses in Iceland. They’re easy to access, too, growing right along the roadside, so we couldn’t resist pulling over for a more immersive experience. Iceland was the final of twelve European countries we visited on our Europe trip, and despite the chill (that wool kept me warm), in beauty it was one of our absolute favorites. The steamy geothermal activity, the waterfalls, the massive volcanoes, the puffins (!!! )… we drove around in awe of the landscape at every turn. That eternal sun is a kicker. On a cloudy day when you can’t place the sun in the sky, it’s midnight before you know it, and you’re still three hours away from your hotel. (We spent a lot of time in the car in Iceland, so I dressed cozy.) Now I understand why many choose to rent campervans and RVs to explore this country. Perhaps we’ll try that next time. I know we’ll return soon. 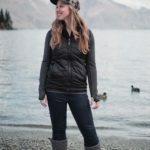 Below you’ll find my perfect outfit for a cozy summer day of exploring in the northerly part of the northern hemisphere. 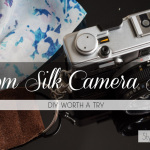 Looking for a way to glam up your travel camera? We’ve got the perfect solution. 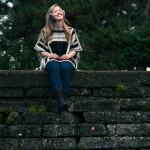 Personalize your photo taker with a DIY camera strap! Whether you want to carry your camera around your neck or prefer a wrist-sized strap, look no further. We’ve got instructions for both. You won’t see a rainy day getting me down! Spring is just around the corner, according to good ol’ Punxsutawney Phil. But there was still a chill in the air in Seattle this February, where I spent all 29 days of the leap year month in this city’s notorious raininess. After spending the winter holiday months in Southern California, Seattle would give us a nice change of scenery and an opportunity to visit friends while we finished some U.S. based projects before heading abroad this spring. With the unrelenting rain, we did get a lot done indoors — the biggest thing being the promo video for my personal travel blog! And this light wooly poncho was perfect for the cozy days I spent tucked away in warm coffee shops working on it. The sun did poke its way through the clouds on occasion, as it did on the day we took these photos, so I did enjoy some outdoor time in Seattle. On those days we’d go for a walk in the park or stroll along Puget Sound trying to spot orca whales, and we even went skiing on two occasions (once at night!) But more days than not, I’d be conquering the cold rain with my new favorite umbrella, a bubble-shaped thing that kept my long hair dry even when it rained sideways! (I now consider this an absolute essential for my travels to Seattle, and since one road-tripping “luxury” is plentiful packing space, I didn’t fret too much over its non-compact size.) I absolutely loved seeing all the green everywhere, but the rain was too dreary for me to not be ready to move on at the month’s end. Seattle, I’ll come visit you again, but next time, I’ll come in summer! Cozy neutrals are keeping me warm this winter! Happy New Year, ladies! I hope you all had an amazing holiday season filled with love and warmth and powdery snow (if that’s your thing). Two months ago, I’d already experienced snow in Alaska, but now that it’s January, winter weather has spread further south. I just arrived in Reno earlier this week, and it’s colder than usual. Billboards around town are bragging that they’re getting the best snow they’ve had in years up here! I generally hate the cold, but I do like snow, so we’re going skiing tomorrow — Yay! — and as usual, ski apparel took up a large amount of space in my suitcase this trip. But playtime isn’t the only thing on my agenda, and since most days I’m frequenting local coffee shops to work on my online businesses, I did need to pack some comfy workday clothes: a loose sweater — the cardigan here is actually ‘plus size’ — with a warm hat, warm boots, my favorite jeans (and maybe some long underwear if it’s extra chilly)… yeah… I can stay pretty happy despite the cold. And speaking of cold weather blues, I’m trying something new! Since my activity level plummets in cold weather destinations, I finally got a fitness tracker to remind me to make an effort to keep moving. (So far I’ve only made it to 40% of my goal number of steps each day, but I’m hoping to improve on that in the new year.) I can’t wait to see what 2016 has in store for me, and I hope it sends some amazing things your way, too! I wish you all the very best in 2016! ‘Tis the season. Shopping season! Let’s embrace it together! 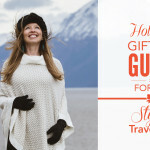 If you’re looking for the perfect gift for the travelista on your list, find it here with over 90 Stylish Travel Girl-approved gifts for travelers. This is no ordinary holiday gift guide. All items on this list have been personally approved and recommended by STG staff and contributors, so they’ve got our official seal of approval! Working on your Christmas wishlist? If you see something you like, just copy the link below each image and email it to friends and family! It’s officially cozy sweater, hot cocoa, and cuddle season! Brrr! Last week I arrived in Anchorage to 40-something-degree weather and the sun lingering low in the sky. A week later, it’s officially reached freezing temps, the wind now has quite a bite to it, and snow will no doubt be falling soon. I’m normally not a cold-weather fan, but I do love the feeling of being ‘cozy.’ Bundling up, flipping on the seat warmer in the car, sipping seasonal Starbucks treats, re-learning how to operate a touch-screen with gloved fingers… winter is coming. And quickly, I might add, here in Alaska. But with sunny Southern California as a home base, the Alaskan chill is a welcome change. Especially when it means I get to wear these adorable new SOREL boots and finally test out my fuzzy UGG snood against the cold (it does a fantastic job). And while I’m still finding plenty of opportunities to wear my fall jacket, this gold-threaded creme-colored poncho warmed me right up (in temperature AND appearance) on this cold and dreary day! Doubling up on my fleece-lined tights helped with that, too. My personal favorite thing about winter, though, is the spike in cuddle time with the boyfriend! 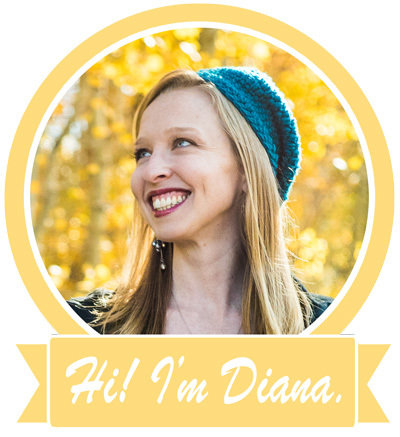 So if the cold weather comes with my fair share of ‘cozy,’ well then, I’ll welcome it with open arms. A new colorful season is starting. Across the country, the leaves are turning from green to vibrant yellows, reds, oranges… even some purples and pinks. I didn’t want summer to end, but change is a good thing. And who doesn’t love the changing leaves of autumn? It’s September now, and despite a quite hot end to summer in upstate New York, green is still present, but no longer the vastly dominant hue. Though I love the warmth and sunshine that summer brings, autumn is my favorite season for shopping! Especially during the transition from summer to fall. It’s a time when you can still get use out of summery fashions, like the romper I’m wearing here, and breathe new life into them by matching them with tights and boots rather than summer sandals. This second outfit in our new series on STG incorporates some of my favorite classic fall pieces. With blacks and grays and a splash of my favorite color, it’s got versatile pieces that will easily match with your other cold-weather wardrobe favorites — throughout this season AND into the next. Perfect for a variety of events and seasons, the jersey knit maxi skirt is a fashionable, flattering and comfortable fashion choice. And it gets EVEN better when you get to pick the fabric! 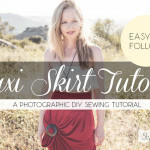 Below is an easy-to-follow photographic tutorial of how to sew your own pleated maxi skirt. Year after year, I wish summer would never end. It’s not that I dislike fall (though I do hate the cold). I just love the feeling of summer. So many good memories are made in summer, and this summer, for me, was no exception. 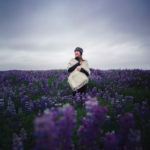 I’ve spent the last three months touring around the U.S. with my boyfriend (and photographer), Ian, and we’ve been treated to an endless supply of scenic beauty, wildlife sightings, and growing success in the blogosphere. This week, we’ve found ourselves on a retreat of sorts, a break from our cross-country 50-state trek, in the peaceful nature setting of the Adirondacks. I’ve had time to think about what I want to spend my time and energy on next, and with my never-ending love for fashion and shopping, this was the answer: a new series of travel outfit posts on Stylish Travel Girl. 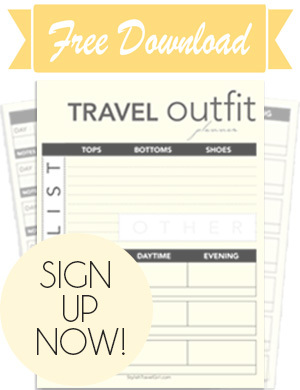 Each month, I’ll have (at least) one new outfit to share here on the blog. I hope you like my first outfit. Here’s to that summer feeling lasting forever! Designer dresses at a commitment-free price… Sure, you’d trust Rent The Runway to get you looking fancy for a night on the town. But can this 5-year old company handle a BIG DEAL task like dressing a bridal party? 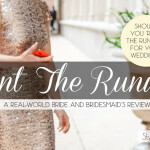 Read our real-world review to find out! Last week I tried ziplining for the first time. It was awesome. The boyfriend and I went to Arenal Volcano in Costa Rica to celebrate our 3-year anniversary, and the views were absolutely breathtaking — even better taken in from high above the rainforest canopy. 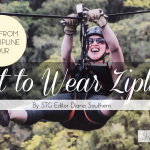 If you’re thinking about giving ziplining a try, DO IT! 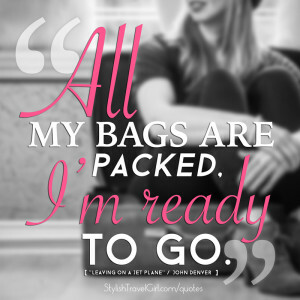 Just make sure you pack accordingly. 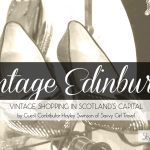 “When it comes to vintage and secondhand clothing, Edinburgh, Scotland is the place to be…” In this article, STG’s newest guest contributor, Hayley Swinson of Savvy Girl Travel, shares her three go-to vintage shops in Scotland’s capital. When you’re a minimalist traveler shopping for shoes, quality is extremely important. A year back, I was shopping for boots for a trip to Norway. They needed to withstand cold temps, rain, and possibly snow. 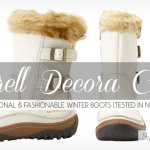 I found myself a warm, waterproof, quality boot that was also stylish! What do you think? For months, maybe years, I’ve been seeing ads on Facebook for True&Co, an online bra shop touting their expertise in finding you perfect-fitting feminine undergarments — with a simple online quiz. Free and straightforward, I risked little with my True&Co test run… or it seemed that way when I placed my order. Allow me to introduce you to Warby Parker, a company that offers a unique model for glasses shopping: home try-on. You pick 5 styles you want to try, they pack and ship them, and when they arrive you’ve got 5 days to try them before sending them back. It’s simple. But really, do “good things await you?” Should you actually “GET EXCITED” like it says on their box? We’ve tested the Warby Parker home try-on service to find out for ourselves. Read on to see how home try-on works and what we experienced in our quest for new glasses. 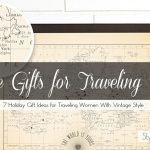 Tis the season for shopping and gift-giving, and if you’ve got a jet-setting vintage lover on your list, we’ve got some ideas to share! 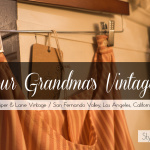 With a romantically eclectic vintage appeal and a mind for the environment, this mother-daughter vintage fashion shop is creating its niche in the LA vintage shopping scene. Read on to find out what — after only one year in business — these storeowners are doing right.